Aaron Paul definitely had the right idea after Sunday's soul-crushing episode of "Breaking Bad." Sporting a scraggly beard and knit hat, the actor kept it fairly incognito while visiting Mickey Mouse and friends in Anaheim, California with his wife Lauren Parsekian on Tuesday. The 34-year-old is currently working on his next project, "Exodus," where he'll play a Hebrew slave who "goes on to lead the people onto the promised land after Moses." Maybe that explains all the facial hair. Paul and his wife will hit the red carpet this Sunday for the 65th Primetime Emmy Awards, where he's up for Best Supporting Actor for his role as Jesse Pinkman on the AMC show. Still bummed from last week's episode? 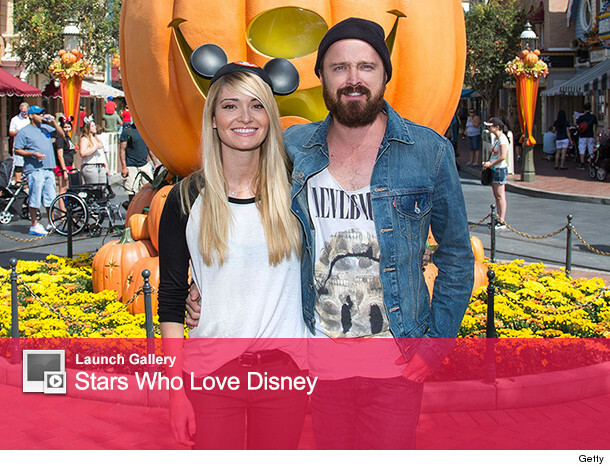 Check out more happy photos of people at Disney above! And be sure to come back here around 3pm PT on Sunday for toofab's full coverage of the Emmys. "The Walking Dead" Is Getting a Spinoff -- Are You Excited?